This wrap dress is refashioned from a vintage button-front dress. I stripped away the buttons and shoulder pads, as well as reworked the front so it’s transformed to a wrap dress. Vintage linen/polyester mix dress, lining fabric remnant, sew-on snap, and hook-and-eye closures were the main materials for this refashion project. Other basic materials for machine and hand sewing completed the list. Read more about this project by visiting DIY Striped Wrap Dress Refashion post. 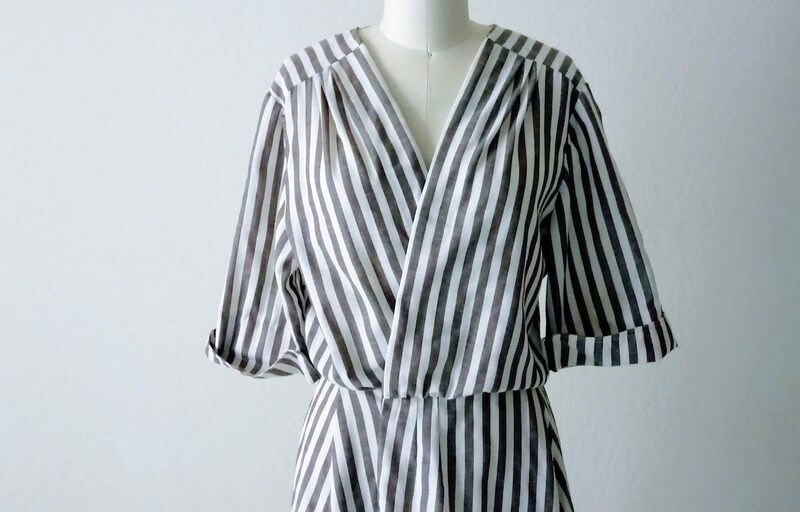 The striped wrap dress is refashioned from a vintage dress with big button closures. With its buttons, collar and lapel parts removed, the dress is transformed to a modern and chic summer dress.